It’s nearly New Years, the time of resolutions and goals. Almost everyone I know is setting a goal to better themselves is one way or another. For a lot of people, that means loosing weight and getting in shape. It’s easy to say you’re ready to get fit, but it’s not always easy to stay on target and keep motivated. I decided I would give Body Media FIT a try and see if it could help me do just that. 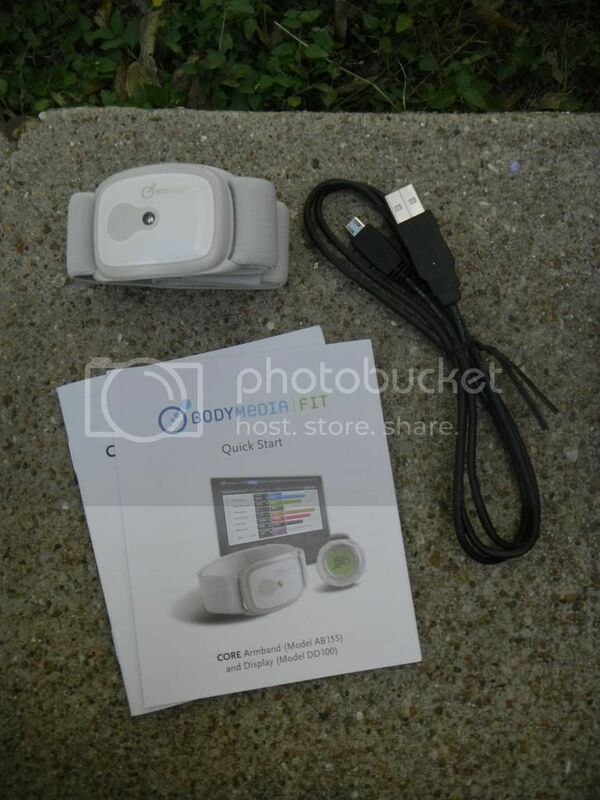 I received my BodyMedia FIT Core Armband a couple weeks ago & I immediately got to work. 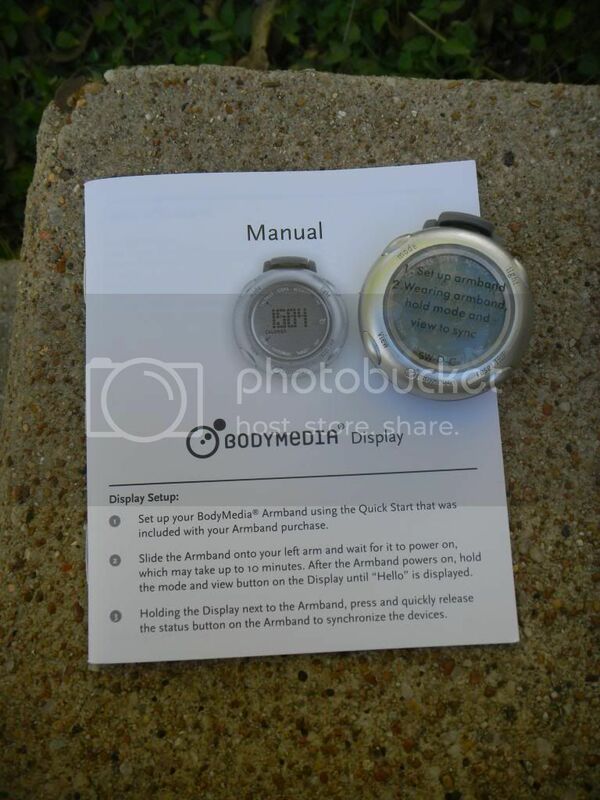 This armband (and the optional display) works with an online program to track your body throughout the day. With the armband, you can track your sleep, calories burned, steps taken, intensity of your workout (or activity). 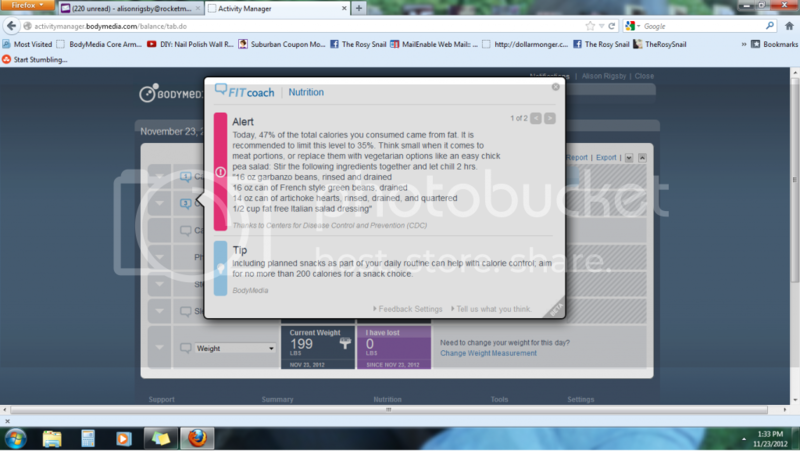 You also input your meals into the program for help with your nutritional needs. To start, I charged my armband with the included cable and I set up my account. The arm band comes with a 3 month subscription to the online program to help you get started. There is a small sound that lets you know that the arm band is connected to your body. This is an actual screen shot from when I set up my armboand. I set a goal to be my target weight and loose about 50lbs by April. 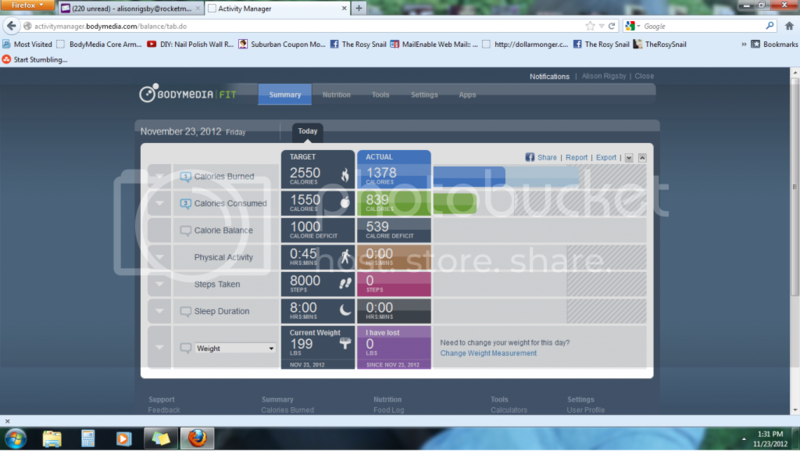 In order to do that, I need to take 8000 steps a day, have 45 minutes of activity and have a calorie deficit of 1,000. That means I need to burn 1,000 more calories than I consume. Most days, it was easy to get just over 7,000 steps in my day chasing around two toddlers, but I often had to push to get my last 1,000, but I really enjoyed the challenge! While I didn’t find it hard to stay within or under my 1800 calories a day goal, the program was quick to catch mistakes I was making that I didn’t even realize I was doing. Like this day I decided to have Kolaches for breakfast! The fat content was out of this world! Needless to say, I haven’t had one since. There are tips that will pop up fro all aspects of your health, whether you’re diet should be improved or you’re not getting enough rest, I loved that this program was there to guide me. It was also there to cheer me on! 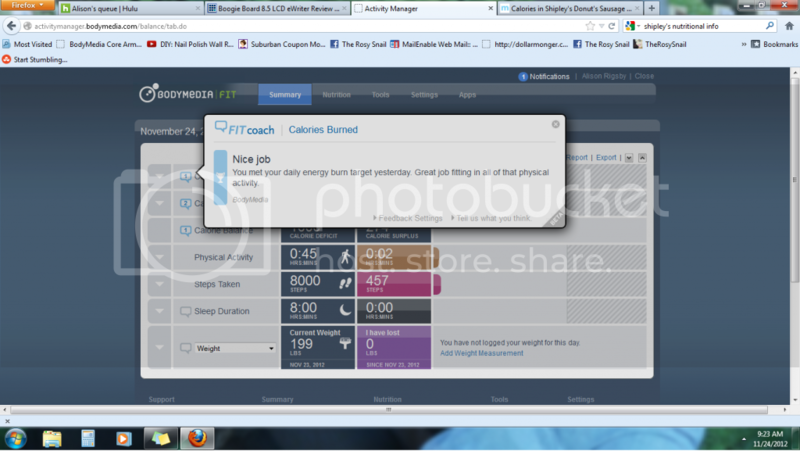 It would congratulate me for meeting my goals or having a personal best! They say that the Body Media FIT program and armbands can help you loose 3 TIMES more weight, but I know what you might be thinking. HOW? It doesn’t actually burn calories for you, so what’s the point? I found that the best part was that this gave me more accountability and knowledge as to what I was putting into my body and what I was getting out of it. It wasn’t until I had to enter in all my meals, that I realized just how much Soda I was actually consuming in a day. I also realized that I get less than 5 and a half hours on any given night. Sleep is an important part in any weight loss journey, but more importantly in your overall health! This entry was posted in Technology and tagged body media, diet, health, highlight, look, program, Review, screenshots, sleep, weight loss.